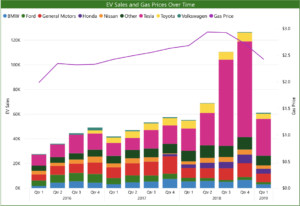 Growth in the electric vehicle (EV) market has slowed in the first quarter of 2019. While this year’s Q1 sales are 10 percent higher than last year, 2018 Q1 sales were 32 percent higher than in 2017. March marks the second straight month of low growth compared to the same time period last year. EVs have been affected by an industry-wide slowdown with total auto sales down three percent in March. After peaking at almost four percent of total U.S. light-duty vehicle sales in November 2018, EVs accounted for just under two percent of March sales based on data from Automotive News and the EV Hub. Some have attributed the slowdown to Tesla’s first quarter focus on the European and Chinese markets. Over 5,000 Model 3 deliveries in Norway alone helped the country achieve over 58 percent of EV sales as a percentage of total light-duty sales for March. Slow growth has not seemed to hinder private sector investment in the EV industry. Automakers have responded to public pressure by increasing investment in electrification. Over $1.2 billion in combined investment from Ford and GM is expected to produce new long range EVs at affordable prices. Declining EV sticker prices could help spur growth in the industry. A recent report from the International Council on Clean Transportation (ICCT) estimates that average all-electric vehicle purchase prices could fall below those of conventional fuel vehicles within five to 10 years. The analysis attributes this to declining battery pack prices. From a fuel savings standpoint, total cost of ownership for an all-electric vehicle is already lower than conventional vehicles in some cases. On another front, the U.S. government looks poised to develop a coordinated effort to expand American influence within the EV supply chain to compete with China’s hold over the global minerals trade and battery industry. China currently accounts for over two thirds of lithium-ion battery production. Proposed efforts would expand the search for domestic deposits of lithium as well as research into new extraction methods and investment in recycling. A domestic market for lithium could bring battery prices down faster, accelerating the cost parity timelines projected by the ICCT. Track developments in policy and the EV and charging market on the EV Hub and stay tuned for our full report on the first quarter sales and other market activity coming later this month.